Thank you, Alton and Good Eats, for inspiring me to try hummus. Since I’ve never tasted hummus I have no point of comparison; however, Alton’s recipe, in my opinion, is very good. I wanted to taste the hummus with an unflavored cracker; thereby allowing the hummus flavor to shine. I chose an artisan cracker sold by Whole Foods. 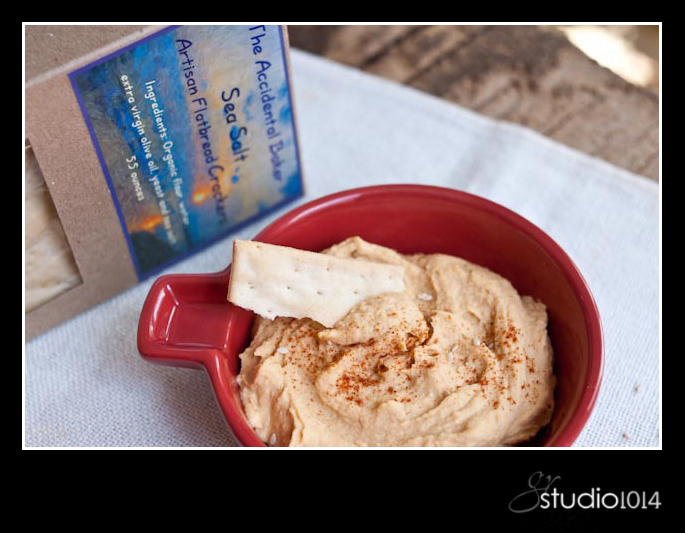 ‘The Accidental Baker’s’ Sea Salt Artisan Flatbread Crackers (made in North Carolina) were the perfect choice. I highly recommend this product! 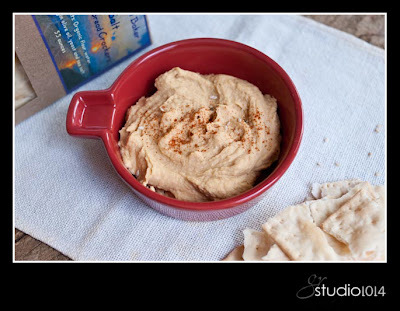 Hummus recipe adapted from Good Eats, found HERE on the Food Network. Also, click here for some nutrition information related to chickpeas. Cook on low for 8-9 hours. Drain the beans, reserving some of the liquid to add to the hummus if needed. This will yield about 40 ounces of cooked beans. My adaptation of the Good Eats recipe uses 10 oz or 1/4 of this recipe. I either add the remaining beans to a soup or freeze the beans for future hummus. I don’t think you can over-process; I mix until the hummus is as smooth as I like. You may need to add a little more liquid if you want a thinner hummus. For me, the recipe listed above was perfect. I’m now ready to try various flavor-versions of hummus. A simple internet search yields numerous add-ins for my future hummus preparations. This entry was posted in 'The Accidental Baker', chickpeas, flatbread crackers, garbanzo beans, hummus by galereeves. Bookmark the permalink.